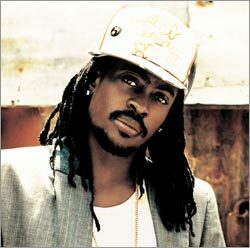 Beenie Man (aka Moses Davis) was born in the tough Waterhouse district of Kingston, Jamaica, on August 22, 1973. By the time he was ready for school, the toddler had already decided on a career as a DJ. He wasn't the first tot with dreams of the limelight, but Beenie actually had a true gift for gab. His shot at stardom came when he was only eight, when he took first prize at the national Teeny Talent contest. This led to a meeting with producer Junjo Lawes, who recorded the diminutive DJ's debut single, "Too Fancy." Bunny Lee then took the boy under his wing and put him to work at his Unlimited sound system. By 1983, the youngster found himself appearing on Lawes' Junjo Presents Two Big Sounds, which was recorded live and featured such DJ heavyweights as Dillinger and Fathead. Along with Unlimited, Beenie was also DJing at Prince Jammy's and Volcano sound systems, had a hit single to his credit, "Over the Sea," produced by Niney Holness, and even had a debut album out. Produced by Lee, The Invincible Beenie Man, the 10 Year Old DJ Wonder's title pretty much sums it all up. He recorded some material with Barrington Levy in 1984, two of which, "Under Mi Sensi" and "Two Sounds," would resurface in remixed form later in the '90s. But for the moment, his recording career came virtually to a close, bar the occasional single. But the young DJ remained a sound system favorite, even as he now turned his attention to his schoolwork. Not surprisingly, Beenie's younger brother, Little Kirk, was keen to follow in his footsteps and five years later, the siblings hooked up with producer Patrick Roberts and began recording a series of singles that quickly brought them into the national spotlight. In 1992, Beenie appeared at Reggae Sunsplash and such was the response that the DJ now felt ready to take on the big guns. Beenie's first target was the acclaimed Bounty Killer, although the young DJ had cause for his attack as the veteran had stolen his catch phrase, "people dead," and the war was on. There was a lull in the very public battle in 1993 when Beenie left Kingston for almost a year after being booed off the stage at a national show celebrating the visit of Nelson Mandela. Upon his return the next year, there was a public reconciliation with Bounty Killer, which resulted in the split album Guns Out. Beenie had obviously had a major change of heart, further evidenced by his single "No Mama No Cry," a version of Bob Marley's "No Woman No Cry," a scathing indictment of violence, inspired by the murder of fellow DJ Pan Head. The song topped the Jamaican chart and brought the DJ instant acclaim. Jamaica's violent crime rate remains shockingly high, and affects people at all levels of society. While drug overdoses and suicide are a proportionately high cause of death for American artists, in Jamaica, murder is often the tragic cause. That many of these crimes go unsolved, Pan Head's included, add to the emotional devastation and so does the fact that the violence seemingly comes in waves, carrying off a number of noted figures in the course of a year. Beenie, too, was affected by these events and Sly & Robbie, the producers of his "No Mama No Cry" single, were instrumental in guiding the young DJ toward his conversion to Rastafarianism.